On December 29, we arrived back in Bangkok. Six months ago, I’d never been here. Now, this is my third visit. So I’m getting a lot more comfortable getting around and doing stuff, in general. There was a bit of a surprise as we passed through immigration control. They gave us 30-day tourist visas, as we expected. But the date of expiration is January 27. The problem is we already made plane reservations to fly from Bangkok to Denver on January 28. That’s because if you look at a calendar, 30 days after December 29 is January 28. But apparently, the 30 days includes the whole day you arrive and the day you depart. 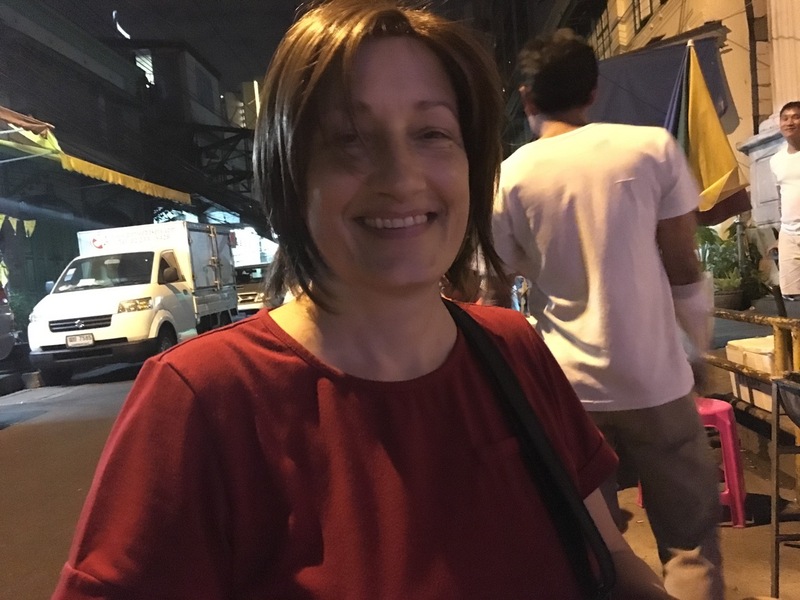 We talked to the butch immigration control supervisor (she’s going to come up again later in this story) about the issue. She said not to worry about it. If you stay one extra day, there is no fine. Two days, there is a fine, but one day, no fine. “Trust me,” she said. And since I remember her from one of my previous trips to Thailand, I did trust her. So for one day in January, we’ll be in Thailand illegally. If we get thrown in the king’s prison for the rest of our lives, now you’ll know why. We decided to stay in the same hotel as the first time we were here, Pas Cher Hotel de Bangkok. The neighborhood (Bang Rak) is really nice, it’s convenient to both BTS (the Bangkok metro) and river travel, and the place is clean and comfortable. 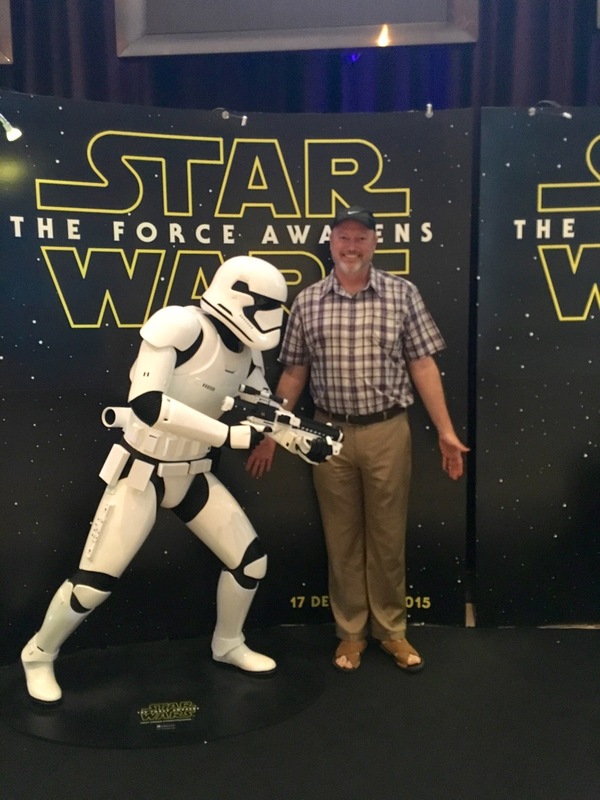 At the top of my list for what to do in Bangkok was to go see the new Star Wars movie. It had been out a couple weeks here, and we weren’t able to see it in India. So I did a bunch of research, found the biggest and most modern cinema in town, and on the 30th we took the BTS to Siam Paragon. That’s a huge upscale shopping mall near the Siam BTS station, which makes it very easy to get to. How upscale? Well, there’s a Maserati dealership, a Porsche dealership, a Lotus dealership, a BMW dealership, and a Lamborghini dealership right in the shopping mall. But that’s not what we came for. We came for pho, and we came for Star Wars. This mall has two (!!!) pho restaurants, it turns out, as well as a great concierge who spoke really good English and was able to direct us to the better of the two. This was the first pho place I’ve eaten where they had combo meals. 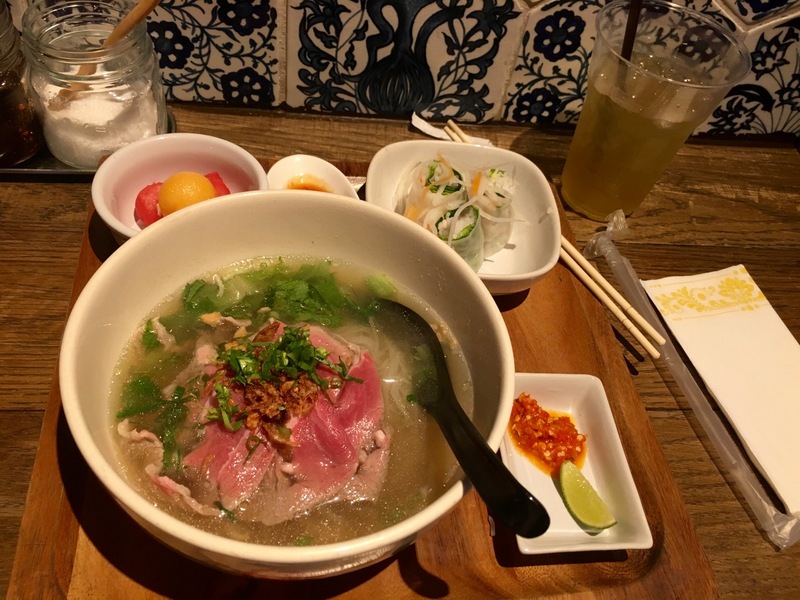 My combo included a bowl of pho tai, a little fresh spring roll, some pickled vegetables (what I think of as kimchi, though that’s Korean), and some very perfect melon balls for dessert. After lunch, we proceeded to the theater. I had already purchased really good seats for us online, fearing it was going to sell out. The seats were good, but there was no danger of the place filling up. I’d say only about 1/10 of the seats were full. There were a ton of ads and trailers before the film, which sorta sucked. And then of course we stood to respect the king, as required by law (and custom). And finally the film. The picture and sound were outstanding. For what it’s worth, I really liked the movie, and Beth was sorta so-so on it. Here I am posing at the Star Wars display. What does this stormtrooper have against my crotch? I don’t know. After the film, I got Beth to shoot a silly photo of me with a stormtrooper, and then we had supper (also in the giant mall), and finally headed back to the hotel. Everyone wanted to come talk to us in English, including one or two guys who were so drunk that they believed they were speaking English but we couldn’t understand a word of it. They wanted us to sing karaoke with them, but I explained that we can’t read Thai. So if there are songs in English we could try it. A few minutes later, just as the music guy (is he called a DJ in karaoke?) started playing “Simple Man” by Lynyrd Skynyrd – a song that is totally in my sweet spot for karaoke – the fireworks went off. This street party included some disco lights to add to the festive look. I don’t know where these tables came from, but they were covered with food and booze by the time we got there. I should mention that people in Bangkok take their fireworks very seriously. I think every big hotel in town has its own really big and expensive fireworks display that’s comparable to the fireworks you’d see at a small to medium city in the US (such as Boulder, Colorado) for Independence Day. So think of a typical American Fourth of July fireworks show and then multiply that by about 10, all going off at the same time in different parts of the city. 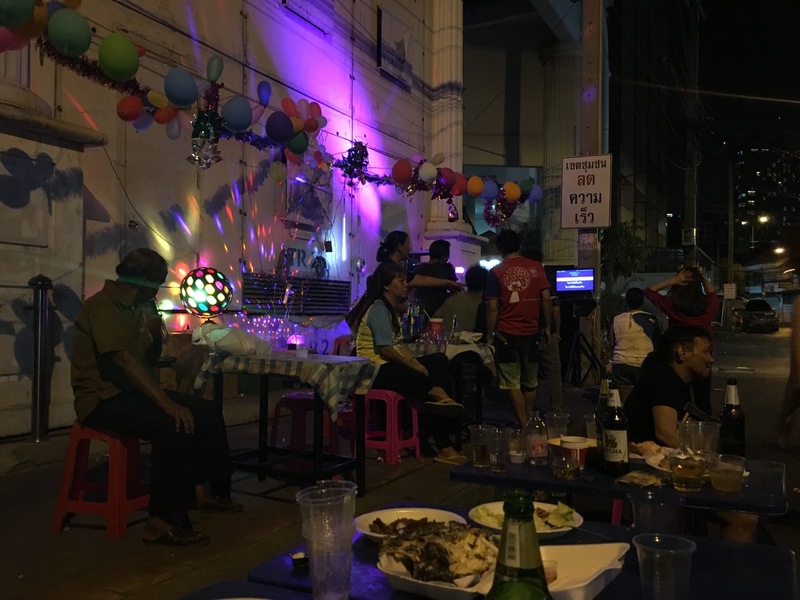 That’s what New Year’s Eve is like in Bangkok. Anyhow, with the fireworks booming, the music stopped, and we enjoyed this other show for a while. And then it was time for a few anthems to the king, where everyone was expected to stand. We didn’t understand any of the lyrics, of course, but we could tell from the way people were singing along that they were patriotic songs. Since the party was literally in the street, the dancing had to stop sometimes to make way for cars. 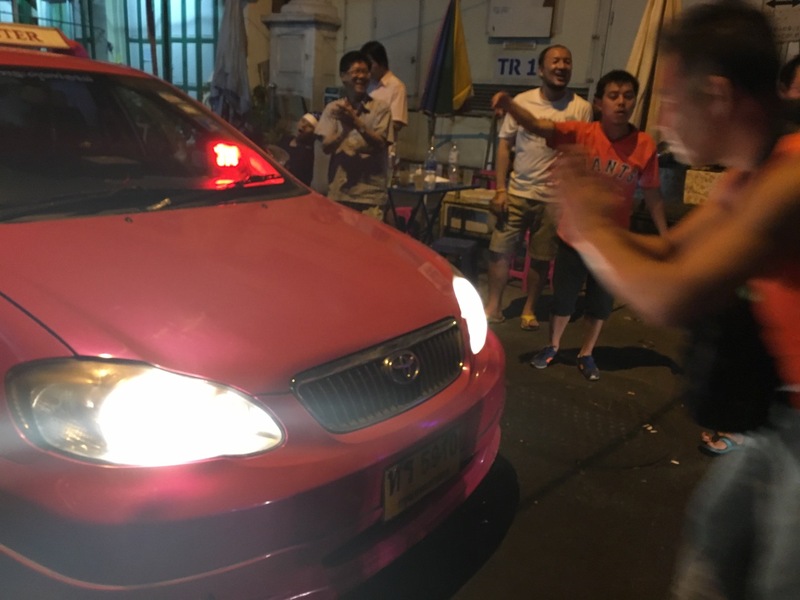 Taxis like this one started coming down this street after midnight all of a sudden. The guy on the right was probably the drunkest reveler and was standing in front of this taxi “wai”-ing to it. That’s the gesture where you give a slight bow with your hands pressed together in a prayer-like fashion. I have no idea why he was wai-ing the taxi. After that, instead of going back to karaoke, it turned into a dance party. One woman who really took a liking to us, told us to please wait here because she was going to get some special food from her home down the block. She came back shortly with a dish of pork and vegetables and potatoes, and so we ate some of that. It was good. Eventually, we were tired out and made our way back to the hotel. Lots of Thais seem to know the English phrase “Happy New Year!” so we were greeted several times by neighbors on the way back.